To ensure that the path required for the passage of trains is kept clear along the route of a railway, a “structure gauge” is imposed. This has the effect of forming a limit of building inside which no structures may intrude. The limit includes not only things like walls, bridge sand columns but also pipes, cables, brackets and signal posts. The structure gauge will vary with curvature of the line and maximum speeds allowed along the section in question. Just as the civil engineer is prevented from allowing his structure to intrude into the train path, the rolling stock engineer also has limits imposed on the space his train may occupy. This space is referred to as the “kinematic envelope“. The area designates the limits within which the train can move laterally and vertically along the route. Speed and features of train design such as bogie suspension and special systems such as tilting that it may have will affect the kinematic envelope. The line route has to be checked from time to time to ensure that the structures are not interfering with the gauge. A line is always gauged when a new type of rolling stock is to be introduced. It is important to see that small variations in track position, platform edge, cable duct location and signal equipment haven’t been allowed to creep inwards during maintenance and renewal programmes. Gauging used to be done by hand locally (and still is from time to time in special circumstances) but nowadays it is mostly done with a special train. The train used consist of a special car with a wooden frame built almost to the gauge limits. The edges of the frame were fitted with lead fingers so that, if they hit anything as the train moved along, they would bend to indicate the location and depth of intrusion. Modern gauging trains are fitted with optical or laser equipment. The optical system uses lights to spread beams of light out from the train as it runs along the line. Suitably mounted cameras record breaks in the light beams to provide the gauging information. The train can run at up to 50 mi/h (80km/h) but, of course, the runs have to be done at night. Laser beams are also used but, as they rotate round the train and form a “spiral” of light, themethod suffers from gaps that can allow intrusions to be missed. 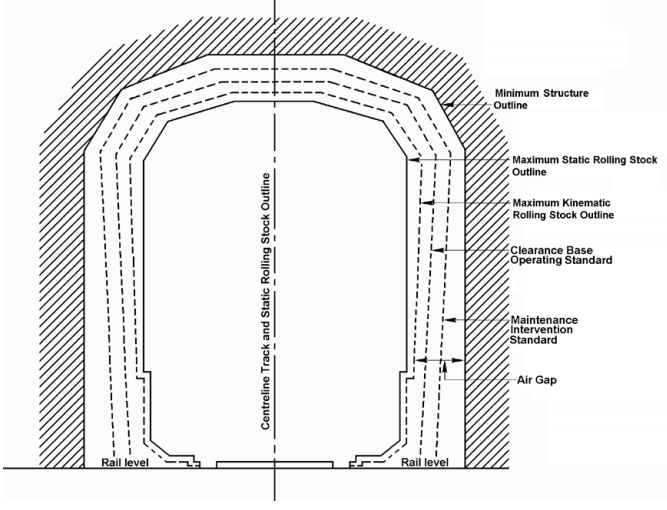 Air Gap; To ensure adequate clearances between rolling stock and structures, or rolling stock on adjacent tracks, monitoring and maintenance of track position is based on the “air gap”. 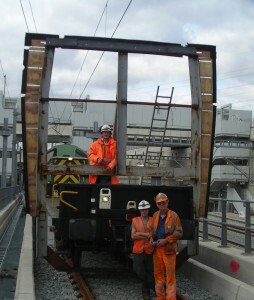 In order to ensure trains would be able to run on the new line at full speed without the risk of getting too close to the infrastructure, a dedicated structure gauge mounted on a flat wagon. The gauge represents the dynamic envelope of a train running in the worst case conditions (speed, cant, etc…). The structure is then circulated at very low speed on every route and junctions and measurements are taken at each ‘hot spots’ to ensure no pieces of infrastructure would ever get into contact with a running train.